Imaging Mission on Barbados. 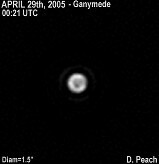 April 19th - May 9th, 2005. 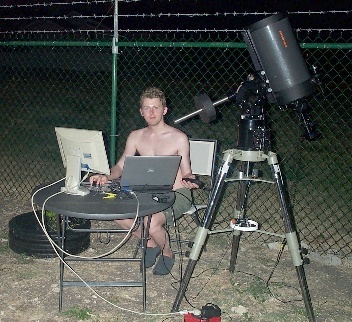 Above: Me imaging from Barbados with the 9.25" Schmidt Cassegrain in April 2005. In this section you'll find images obtained from my first three week venture to the Caribbean island of Barbados. I travelled there in the Spring of 2005 with my Celestron 9.25" Schmidt Cassegrain, and CCD cameras. Below is a presentation of the work obtained from this remarkable location. Barbados is a small tropical island located at approximately Longitrude 60°W, Latitude 13ºN. It is the most easterly of the Caribbean islands, and its location is isolated surrounded by warm tropical ocean as far as the eye can see. The steady prevalence of the easterly trade winds, and almost permanent lack of the 300hPa jestream, leads to very stable seeing conditions for a large percentage of the time. During my stay my concentration was to obtain high resolution images of Jupiter, and also Mars, Saturn and the Moon. The trip was a tremendous success, and a wealth of fine images were obtained, as you'll see below. This success of this trip, lead me to return there again in 2006. 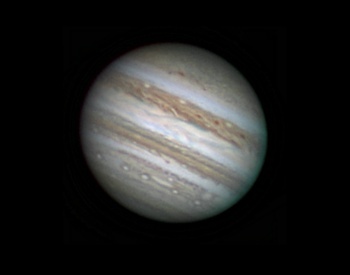 Jupiter Rotation Movie & Map. .A complete rotation of Jupiter on April 25-26th, 2005. Map of the entire face of the Planet from the same dates. 9.25" Schmidt Cassegrain. Lumenera LU075M CCD camera. A famous binary. 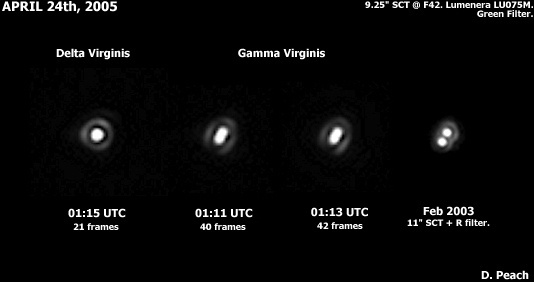 .During April-May 2005 the bright binary star Gamma Virginis reached periastron, and this presented a once in a lifetime opportunity to catch this binary system at its closest. 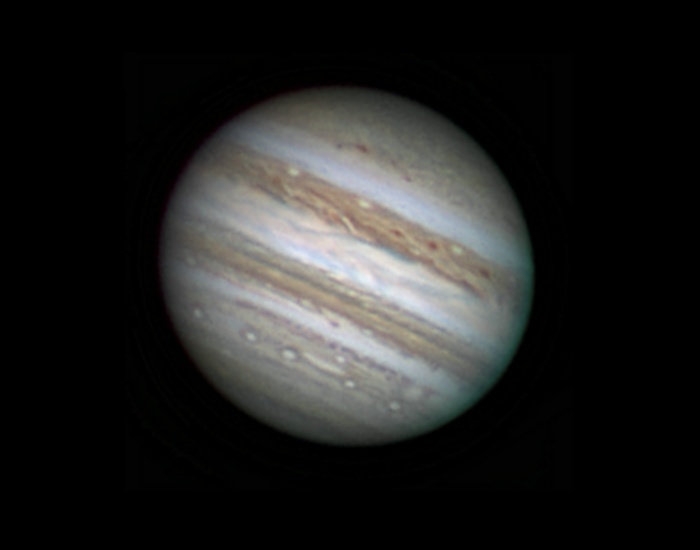 Note the resolution differences through each filter. 9.25" Schmidt Cassegrain. Lumenera LU075M CCD camera. 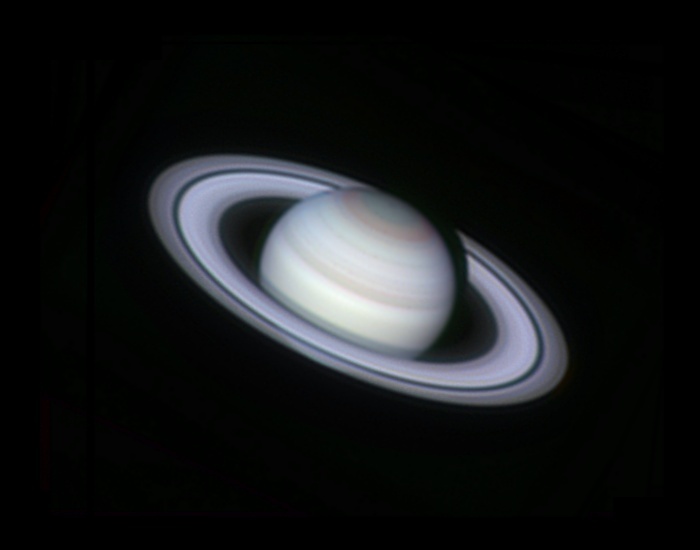 Saturn on April 28th, 2005. .As if one evening wasnt enough, another evening of perfect seeing occurred the next day yet more stunning views 9.25" Schmidt Cassegrain. Lumenera LU075M CCD camera. 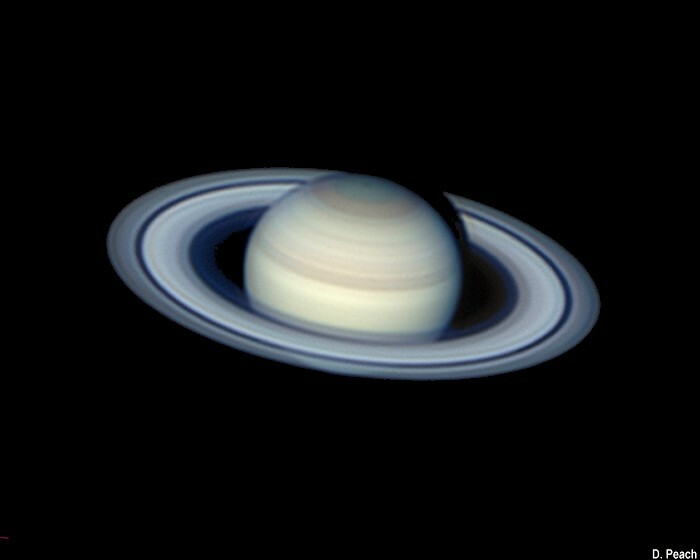 Saturn on April 27th, 2005. .An evening of perfect seeing with stunning views visually 9.25" Schmidt Cassegrain. Lumenera LU075M CCD camera. Saturn on April 25th, 2005. 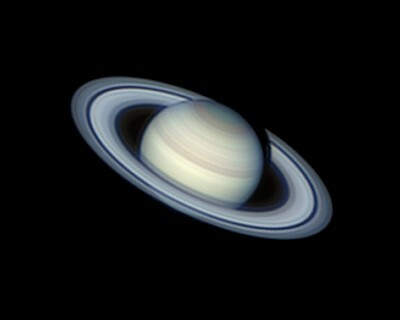 .The great seeing persisted for a third evening on the ringed Planet. 9.25" Schmidt Cassegrain. Lumenera LU075M CCD camera. 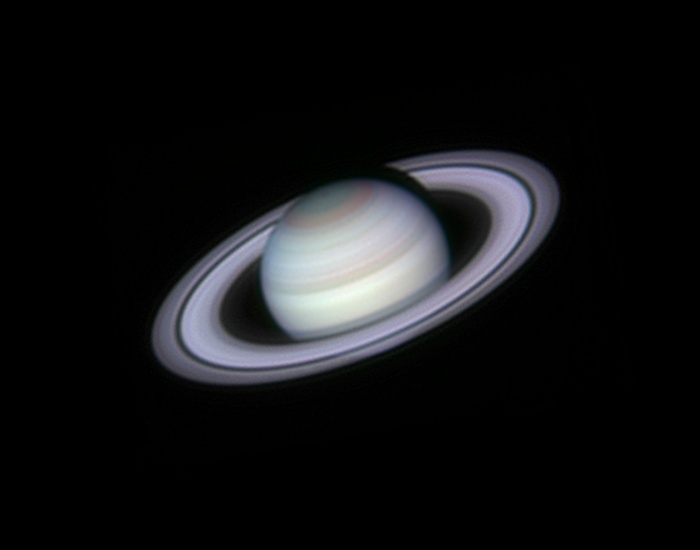 Saturn on April 24th, 2005. 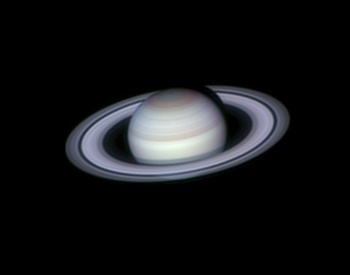 .Another fine view of Saturn on the second evening of imaging it. 9.25" Schmidt Cassegrain. Lumenera LU075M CCD camera. Saturn on April 23rd, 2005. .The first image of Saturn during the observing mission. 9.25" Schmidt Cassegrain. Lumenera LU075M CCD camera. Mars rotates. .An animation showing the changing features and surface details during a three week period. Note also how the Planet grows larger. 9.25" Schmidt Cassegrain. Lumenera LU075M CCD camera. 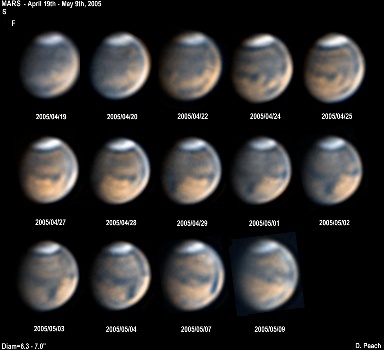 The faces of Mars .During my stay i was able to obtain almost a complete rotation of Mars, even though the Planet was between 6" and 7" in angular diameter. Many early morning session were needed to obtain this set. 9.25" Schmidt Cassegrain. Lumenera LU075M CCD camera. 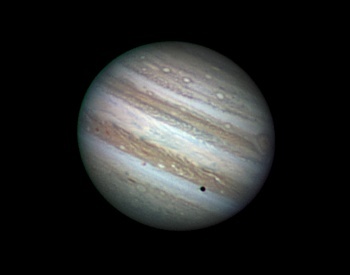 Jupiter on May 7th, 2005 .Ganymede is seen approaching occultation with surface detail seen, while the GRS has appeared over the limb.. 9.25" Schmidt Cassegrain. Lumenera LU075M CCD camera. Jupiter on May 4th, 2005 .A transit of Io is in progress across the NEB (see below for close-up.) Also Oval BA and the SSTC ovals are well seen.. 9.25" Schmidt Cassegrain. Lumenera LU075M CCD camera. 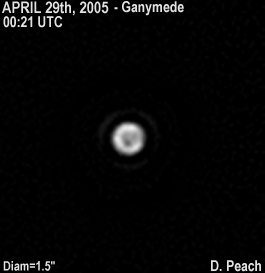 Io in Transit, May 4th, 2005. . Again showing Io in transit across the NEB with surface detail - note its bright equator and dark polar areas, also seen on April 27th. 9.25" Schmidt Cassegrain. Lumenera LU075M CCD camera. Jupiter on April 30th, 2005 (Part 2.) The GRS, SSTC and post GRS areas are well seen.. 9.25" Schmidt Cassegrain. Lumenera LU075M CCD camera. Jupiter on April 30th, 2005 (Part 1.) 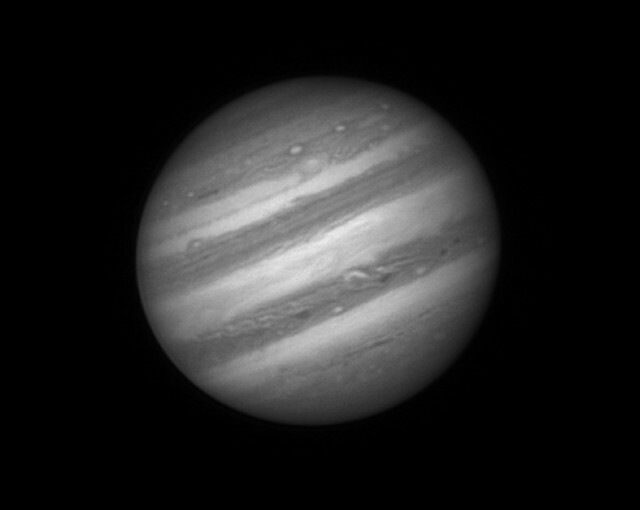 The GRS, SSTC ovals and many other feature are well seen in these images.. 9.25" Schmidt Cassegrain. Lumenera LU075M CCD camera. 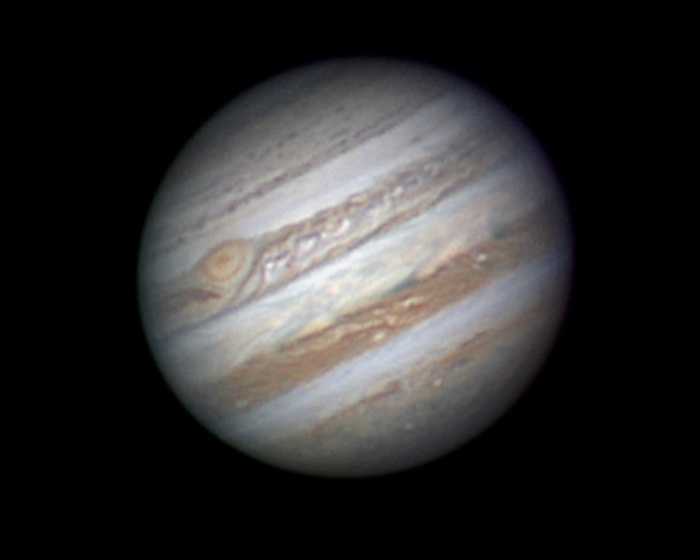 Jupiter on April 29th, 2005 (Part 2.) . Oval BA again seen in this image. Ganymede also with surface detail. Also a Blue Light image of Jupiter clearly showing a white core to Oval BA. 9.25" Schmidt Cassegrain. Lumenera LU075M CCD camera. Jupiter on April 29th, 2005 (Part 1.) . Oval BA, along with a wealth of fine detail can be seen in these images. 9.25" Schmidt Cassegrain. Lumenera LU075M CCD camera. Jupiter on April 28th, 2005. . The GRS and turbulent post GRS region are well presented here. 9.25" Schmidt Cassegrain. Lumenera LU075M CCD camera. 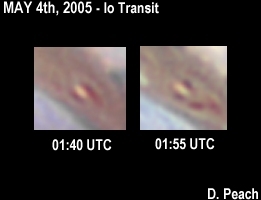 Io in Transit, April 27th, 2005. . An animation showing Io in transit across the NEB with surface detail. 9.25" Schmidt Cassegrain. Lumenera LU075M CCD camera. Jupiter on April 27th, 2005. . Two images showing a transit of Io, and the array of SSTC ovals. 9.25" Schmidt Cassegrain. Lumenera LU075M CCD camera. 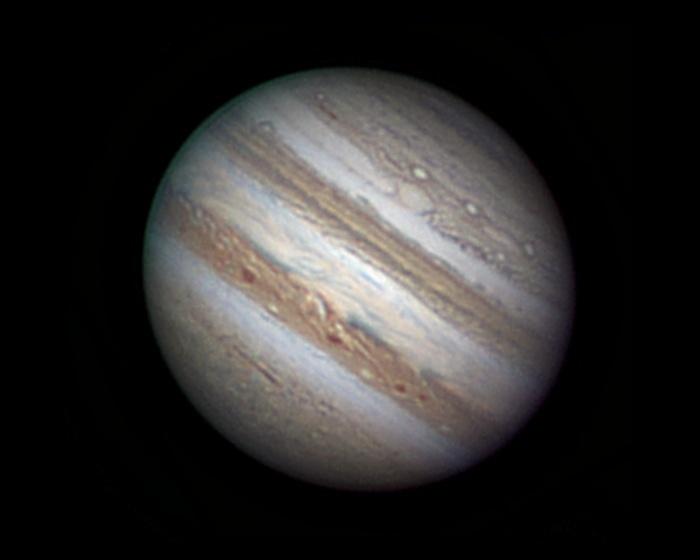 Jupiter on April 26th, 2005 (Part 2.) . 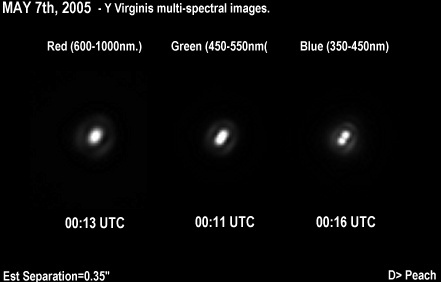 Two further images showing the post GRS area and SSTC white ovals. 9.25" Schmidt Cassegrain. Lumenera LU075M CCD camera. Jupiter on April 26th, 2005 (Part 1.) . 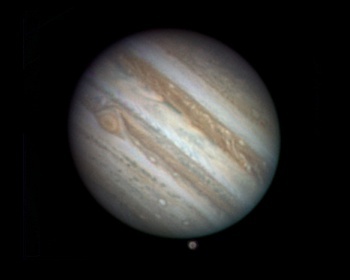 Two images showing the post GRS area. 9.25" Schmidt Cassegrain. Lumenera LU075M CCD camera. Voyager style time lapse animation. One of the great achievements of the trip was to produce this short voyager style time lapse of the entire planet, showing the movements of the currents and jetstreams. The first time this has been achieved from the ground, and the only time i have seen such an animation that wasn't spacecraft produced :-). 9.25" Schmidt Cassegrain. Lumenera LU075M CCD camera. The entire face of Jupiter. 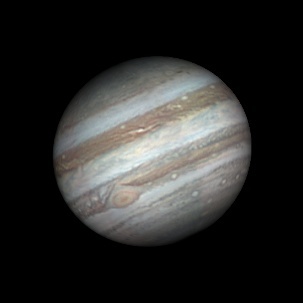 A cylindrical projection map of Jupiter showing the entire Planet on April 25-26th, 2005. 9.25" Schmidt Cassegrain. Lumenera LU075M CCD camera. Europa in transit, April 25th, 2005. Europa in transit across the North Tropical Zone showing surface detail - the first time this has ever been seen in amateur imagery. 9.25" Schmidt Cassegrain. Lumenera LU075M CCD camera. Jupiter on April 25th, 2005 (Part 2.) These two images are among the best ever taken from the Earth's surface by an amateur telescope, and possibly the best Jupiter images of the entire mission. 9.25" Schmidt Cassegrain. Lumenera LU075M CCD camera. Jupiter on April 25th, 2005 (Part 1.) Europa is seen in transit across the cloud tops. Note the globe like appearance. 9.25" Schmidt Cassegrain. Lumenera LU075M CCD camera. Jupiter on April 24th, 2005. Oval BA, and a spectacular mid-NEB rift are some of the many features seen in these images. 9.25" Schmidt Cassegrain. Lumenera LU075M CCD camera. 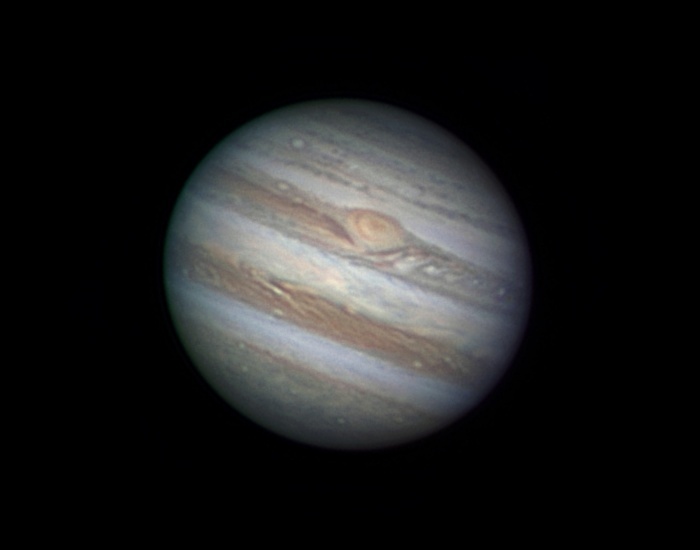 Jupiter on April 23rd, 2005. The Great Red Spot and its following turbulent region is seen with superb clarity in these images. 9.25" Schmidt Cassegrain. Lumenera LU075M CCD camera. Jupiter on April 21st, 2005. A considerable wealth of detail can be seen in this view of the so called "boring side" of the Planet - anything but boring from Barbados!. 9.25" Schmidt Cassegrain. Lumenera LU075M CCD camera. Jupiter on April 20th, 2005. Some of the first images of Jupiter obtained during the mission. 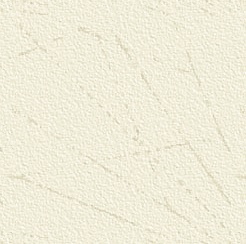 A wealth of fine detail can be seen across the entire Planet. 9.25" Schmidt Cassegrain. Lumenera LU075M CCD camera.